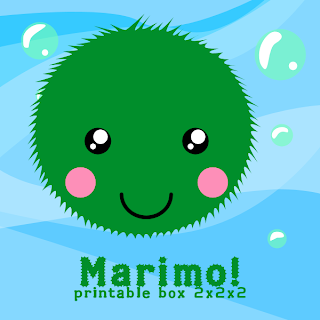 Marimo マリモ or are little moss balls that live and grow underwater. They keep their shape by the motion of the water rolling them constantly. 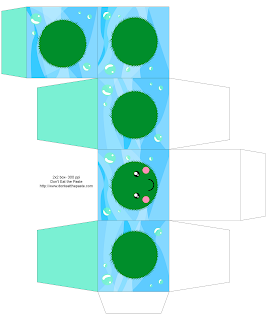 They've become a symbol of good luck with domesticated varieties being kept in jars and bowls in the home and office and tiny marimo balls being used in jewelry and as charms for keys and phones. They also don't have cute little faces. But I like putting faces on things! So here's a printable marimo box. I hope you enjoy it! Click on the image for a larger version. Print on card stock, cut out, score, fold, glue. So cute!!! Thanks for teaching me something new today.